Above is a small selection of audio that represents a range of projects I have worked on in the ICAM Music program at UCSD. 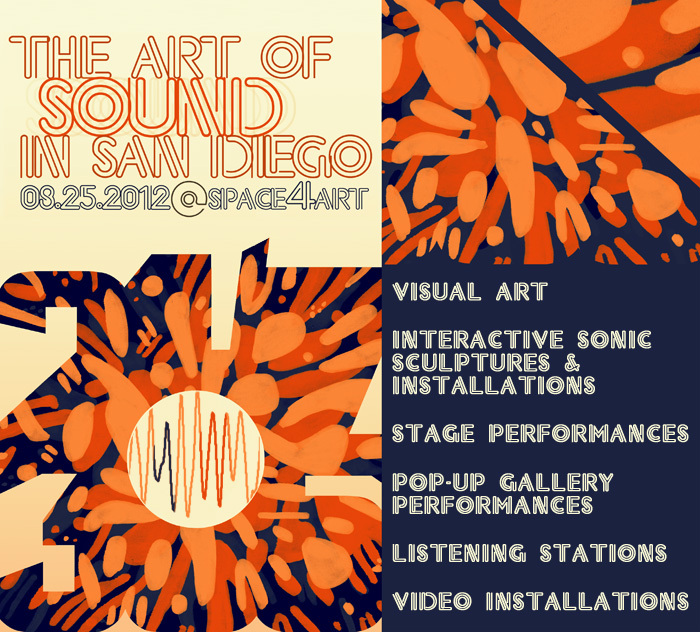 On August 25th 2012, I played a small part in the event entitled “The Art of Sound in San Diego” at the newly non-profit Space 4 Art. I was invited by one of Space for Art’s residents and UCSD Music Department doctoral candidate Chris Warren to volunteer. At this event I mixed sound for the installations inside the venue’s gallery including Jason Ponce‘s Primal Screen, a video piece from Berglind Tómasdóttir and Christian Kjeldsen’s Collided Collapse among others. Managing a set time schedule around the event’s “pop-up performances” proved to be a difficult yet rewarding task. Each piece had a unique set of technology that was required, from iPad to make-shift video booths to Wii remotes. In the end the experience was one of the most valued and inspiring I have yet to be a part of. Tittle: trans·code /ˌtransˈkōd/: digital-to-digital data conversion of one encoding to another. Physical CDs are used to produce a time based image. Subsequent images are transcoded to digital audio signal based on RGBA data. In the spring of 2012 I signed on to manage online content for ADDO, UCSD’s largest student run art show, which was held over May 29th thru May 31st in Price Center’s East Ballroom. Little did I know that in a matter of a few short weeks my title would be changed from online content editor to “producer” as I got further involved with the organization of the event. This new title that was bestowed upon me required working with a team of about five core members to distribute tasks and make decisions regarding the event. Potty Mouth uses a simple python script and scraperwiki.com to scrape twitter for a particular curse word. This scraped text is then converted to audio via a text to speech conversion software. The piece explores the contrast between what people write somewhat anonymously on the internet compared to being spoken aloud. 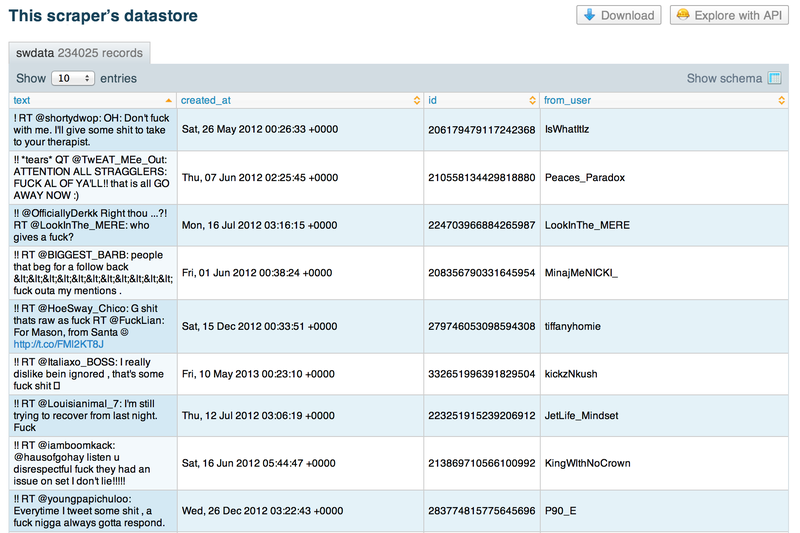 The first run of Potty Mouth resulted in nearly an hour an a half of audio from a few seconds of scraping twitter.com. The Universal Language Orchestra is a collaboration between University of San Diego California’s Music Department and the Spring Valley Community Center in Spring Valley, CA. ULO provides non-traditional music making and instrument building to students from the ages 6 to 12 most with little to no previous music experience. My participation began when I was approached by Adam Tinkle and Joe Mariglio who led the ULO sessions with volunteers from within UCSD like myself. 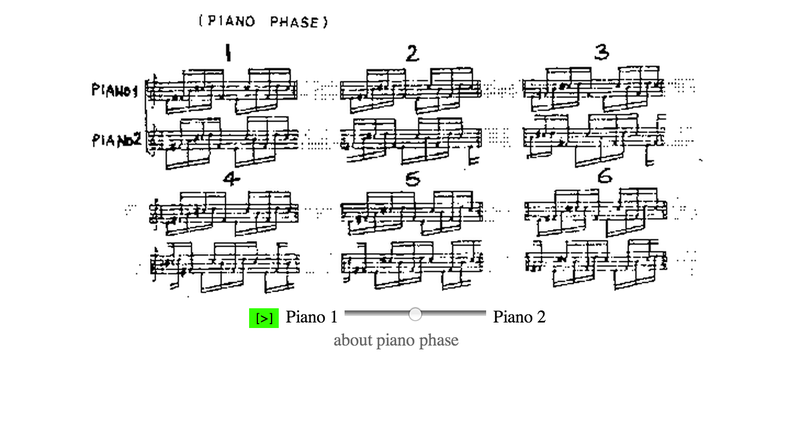 In 2012, I created a tribute of sorts to Steve Reich’s piece Piano Phase. 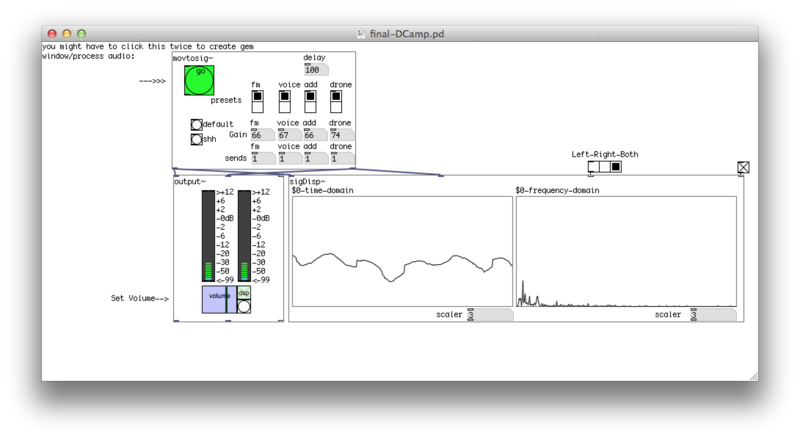 My version Page Phase used the Web Audio API and Processing.js for the visual element. the page plays two looping pianos at different speeds. The result is an example of phasing where to the listener many mutations of rhythm become apparent as the two pianos move further away and also back in time with each other. The listener can also experience the difference in the two sounds by adjusting the crossfader between the two loops on a separate page. The entire piece loops back in about 30 minutes, although it only takes a little bit to start to hear the two sounds out of phase. Web Audio API is best supported on Google’s Chrome and Apple’s Safari browser.